With the crisis at the nuclear plants in Fukushima, Japan still underway, there's been a lot of discussion of radiation in the news recently, particularly how dangerous it becomes at different levels. 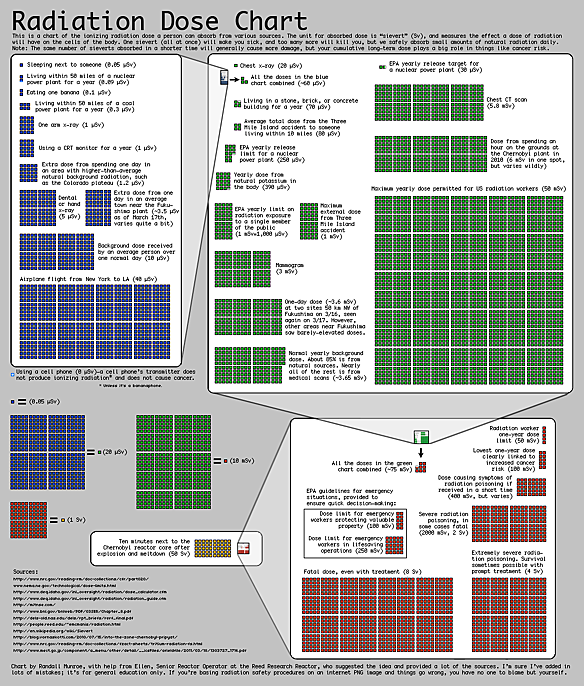 It's kind of hard to visualize as a layman, but fortunately Randall Munroe, the creator of the popular webcomic xkcd, has made it a little easier with a colorful and comparative chart he compiled with the help of a friend who works as the Senior Reactor Operator at the Reed Research Center. There's a lot to learn, including the fact that you absorb as much radiation from eating a banana as you would from living within 50 miles of a nuclear power plant for a year. As Munroe warns, however, he is not personally an expert, and the chart is "for general education only. If you're basing radiation safety procedures on an internet PNG image and things go wrong, you have no one to blame but yourself." Click through below to see the full version.